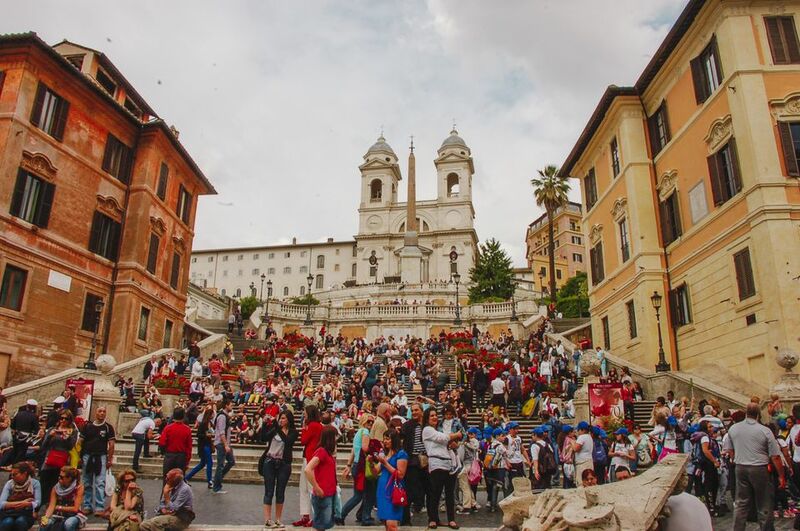 During your wanderings in Rome, you'll probably stumble upon the Spanish Steps, or Scalinata di Spagna—one of the biggest tourist draws just north of Rome's centro storico. Constructed by the French in the 1720s as a gift to Rome, the regal open-air staircase links the Piazza di Spagna, named for the presence of the Spanish Embassy, to the Trinità dei Monti church, which dominates at the top of the steps. The Spanish Steps are wildly photogenic, especially in springtime when they are covered with pots of blooming azaleas. The one thing you have to do at the Spanish Steps is climb to the top. There are 138 stairs, but each step is shallow, and the climb is broken up by terraces where you can stop and catch your breath if you need to. Once you reach the top, linger and take in the view of the steps as they fan out below you, as well as the rooftops and narrow streets of Rome. If the church is open and mass is not being observed, you can go in and take a look around—it offers a nice, quiet respite from the crowds outside. Located at the bottom right of the Spanish Steps, this historic home and museum is dedicated to the English Romantic poets, several of whom lived in or frequented Rome in the early 19th century. John Keats died in this house in 1821, when he was just 25 years old. Today, his bedroom is preserved as it was at his death. Once a playground of the Popes, this vast park contains walking trails, a zoo, a carousel, a small lake with boat rentals, cafes, pony rides, and even a tiny cinema. It's also home to two of Rome's greatest art museums, the Galleria Borghese and the National Etruscan Museum at Villa Giulia. The former is a stellar collection of mostly Renaissance and Baroque art, while the latter contains thousands of artifacts from the pre-Roman Etruscan culture. You need a reservation to visit Galleria Borghese. One of the most unusual sights in Rome, the Museum and Crypt of the Capuchin Friars contains the skulls and bones of nearly 4,000 Capuchin friars. They're artfully displayed—there are even chandeliers made of bones—but above all, this is a place of worship and reflection. If you're squeamish about death, it's not for you, nor is it suitable for young children. It's located about a 10-minute walk from the Spanish Steps. The vast open space of Piazza del Popolo, one of the largest squares in Rome, offers a lot of breathing room after the dense crowds at the Spanish Steps. The obelisk in the middle of the piazza was looted from Egypt by Emperor Augustus in 10 A.D. On the north side of the piazza, the Church of Santa Maria del Popolo contains works by Raphael, Caravaggio, Bernini, and other Italian masters. Many of Rome's most exclusive temples to high fashion are found on the streets surrounding the Spanish Steps, including Fendi, Bulgari (which paid for a recent renovation of the Spanish Steps), and Valentino, who all have their flagship stores nearby. Other iconic names in Italian fashion, such as Prada, Gucci, and Armani, are within sight of the steps or not far away, on Via dei Condotti, vias Borgongona and Frattini, and Via delle Carrozze. With easy access to the Metro, buses, and the rest of the city, the area around the Spanish Steps is one of the best places to stay in Rome. Although the area is not known for budget properties, it is home to some of Rome's most luxurious hotels. The Inn at the Spanish Steps and trendy Deko Rome are two favorites. For something more affordable, try Casa Howard or the modest Hotel Panda. There is a Metro station, Spagna, at the base of the Spanish Steps, or it's about a 20-minute walk from Piazza Venezia. There's a taxi stand at Piazza Mignanelli, just south of Piazza di Spagna. Though you will see people sitting on the Spanish Steps, prolonged parking at the Steps, including to eat lunch, is prohibited. Because of the dense crowds at the Spanish Steps, be wary of pickpockets. Keep your handbag closed and close to your body, and cameras and cellphones tucked safely away when not in use.